This boiled peanut recipe brings the classic Southern food straight to your kitchen table. Raw peanuts, water, salt, and any other seasonings your heart desires come together in this simple recipe. Reminisce of your childhood days in grandma’s kitchen as you devour this classic snack. Whether you recreate the classic dish you grew up eating or make it your own, portion control will be a difficult feat with these delicious boiled peanuts. Dissolve 1/2 cup salt in 2 gallons water in a 3-gallon stockpot; add peanuts. Soak 8 hours or overnight. You do not have to soak overnight, but it will reduce the cook time by several hours. Drain water and refill pot with water and remaining 1 cup salt. 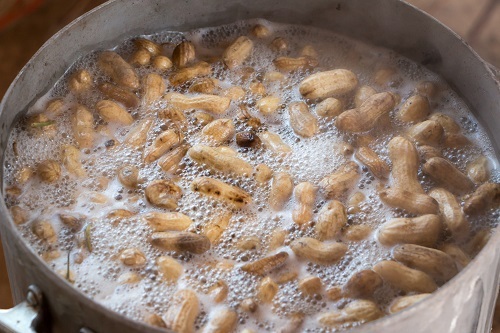 Bring to a boil, reduce heat to medium-low, and simmer, covered, 5 to 8 hours or until peanuts are tender, adding water as needed to keep peanuts covered; stir occasionally. When the peanuts have boiled 2-3 hours, check for texture and saltiness. If the peanuts are not salty or spicy enough for your preference, add salt or spice in 1/4-cup increments. Once you have your desired saltiness or flavor turn off heat, and let soak 1 hour. Check peanuts for seasoning every hour. Once cool, drain and dig in. Store in a sealed container in the refrigerator or freezer. Boiled peanuts will keep up to 7 days in the refrigerator or several months in the freezer.